1.) What are your store hours? Friday & Saturday | 8:30AM – 6:00PM. Saturday | 8:00AM – 6:00PM. 2.) 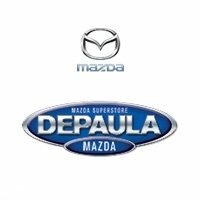 Where is DePaula Mazda located? DePaula Mazda is located on Central Avenue in Albany, NY, next door to Mildred Elley Albany & across the street from Hokkaido Asian Bistro. Click here for store directions. 3.) How do I schedule service? Whether you drive a Mazda or any other make, our online Service Scheduling Tool makes it easy to book a service appointment online by visiting the Schedule Service page on our website. You can also set an appointment by calling 518-375-2160 and speaking with one of our Service Specialists. 4.) What is my trade worth? There are many factors that go into assessing the value of your vehicle such as the Year, Make, Model, Mileage, and Overall Condition your vehicle is in. At DePaula Ford, we use the Kelly Blue Book Instant Cash Offer™ to give you an appropriate “cash value” for your trade. You can use the offer to trade in for something new, or sell your vehicle outright to us, even if you choose not to get another vehicle from us. Visit the Value Your Trade page on our website to claim your trade offer. 5.) How do I apply for financing? Whether you’re purchasing or leasing your next vehicle, DePaula allows you to spend less time at the dealership filling out paperwork by applying for financing online through the Apply for Financing page on our website.